Solar Stereo - Crank it Up! In the ARRL DX contests, DX stations must work the US and Canada - so grab your key and load up on DX contacts! You can also get another dose of digital contesting in the North American QSO Party sponsored by NCJ magazine or even try phone on 160 meters in the CQ WW 160 Meter SSB weekend. No slip-ups noted in the previous issue. The ARRL Rookie Roundup rules have changed to create a Multioperator category and a team competition of up to five Single-operator Rookies. A number of clubs have asked for these changes to help "Elmer" new HF operators. In addition, recognizing the lack of interest in 6 meters for this contest, that band has been dropped. Watch for more information in the April issue of QST. 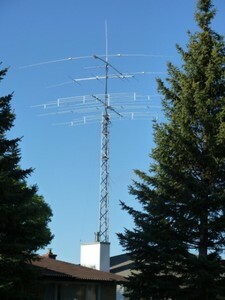 Tony WA8RJF invites weak signal VHF, UHF and microwave enthusiasts to the 17th VHF Weak Signal Group banquet to be held on Friday evening May18th, 2012 at the Dayton Grand Hotel (Formerly the Doubletree Dayton Downtown Hotel) at 11 South Ludlow Street, Dayton, OH 45402. Reservations are required at $35 per person. For more information you can contact Tony by email. EDN magazine asked the engineering profession, "Why did you become an engineer?" The responses are wide-ranging and interesting, some funny, some thoughtful. One might see parallels to the question, "Why did you become a ham?" Here's a great resource for planning your contest weekend and tracking down the "who's who?". Bill NG3K has been tracking upcoming contest expeditions and provides many other resources on his "one-stop-shop" website. Field Day planning is under way across the land and the bonus points for a satellite contact are often on the list of things to do. This year will present more challenges because of the final shutdown of AO-51 and gradual degradation of several other smaller satellites. From the AMSAT ANS-036 bulletin comes word that, "The congestion on FM LEO satellites was so intense in prior years that we must continue to limit their use to one-QSO-per-FM-satellite. This includes the International Space Station. You will be allowed one QSO if the ISS is operating Voice. You will also be allowed one digital QSO with the ISS or any other digital, non-store-and-forward, packet satellite (if operational)." AMSAT goes on to recommend using the linear transponders on lesser-populated birds such as VUSat OSCAR-52,Fuji-OSCAR 29 (which may or may not be operational), and even the venerable AMSAT-OSCAR 7. How do you type symbols like Ø in Microsoft Word? If you happen to know the character's four-digit numeric code, you can use the ALT key to enter it directly. Otherwise, use the Alt-i "Insert" menu. With the cursor at the point where you want the symbol, type Alt-I, then type s for symbol. A symbol entry window will appear. You can find most of the interesting symbols hams need by selecting the Symbol font and scrolling up and down. This has been an exceedingly rare occurrence - three newsletters during the same month and that month being February! Web Site of the Week - ARRL PR Manager, Allen W1AGP spotted an excellent history of early Amateur Radio by Mark WØBG. Has it really been 100 years? Hams put up antennas but insects have antennae. Just thought you'd like to know! What will the solar future bring? Now that we can see nearly all of the Sun's surface thanks to the NASA STEREO solar monitoring satellites, we can look at what's "comin' around the bend". If the sunspots headed our way pump a little UV into the ionosphere, conditions could be pretty good for the ARRL DX CW contest this weekend! 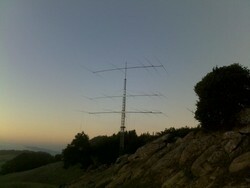 Be sure to post a few photos of your ARRL DX CW operations on the ARRL Soapbox web page! It's a great way to let everybody else know how much fun you had and the writeup authors always appreciate the material. If you have a really good story - contact ARRL DX CW writeup author Nate N4YDU. did not operate this one near here." I guess so! Operating from a rural site in the CQ WW 160 contests makes for low noise but a cold shack. Take a look at the Field Day-style operation in January's CW contest by Ludek OK2ZC and friends as OK5Z! The ARRL Contest Branch welcomes Kevin W9GKA as the results author for the January ARRL VHF Sweepstakes. We are fortunate to have Kevin's experience as a VHF+ focused on the writeups. 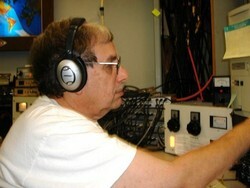 Kevin is collecting anecdotes and photos for the article - post yours on the ARRL soapbox page today! IOTA Contest Manager, Don G3XTT writes, "I am pleased to announce that the final results of the 2011 IOTA Contest now appear online. You will find Soapbox, Photographs, etc. via the results page. A list of trophy winners will be published shortly. Trophies are normally awarded at the RSGB Convention (October) and, for those not able to attend, mailed after that. We are planning some rule changes for the 2012 contest to bring the emphasis back to working island stations. Once we have finalised the rules they will be posted on the RSGB Contest Committee website." Lots of BIG scores were posted in the CQ WPX RTTY contest last weekend. With activity up and conditions improving, records were falling like tenpins! And receivers were crunching like granola! RTTY contests used to be low-key (so to speak) affairs with plenty of elbow room - no longer. Certainly, some expectations will have to adjust but let's also use the tools we have at our disposal. Tighter DSP filtering, moving out of the 080-100 region of the bands, making sure we are not overmodulating and splattering, and using the many receiver gain controls - all are great techniques to "drive in traffic." "What a difference a year makes....! What a difference a mild winter makes...! What a difference a rotor makes....! What a difference adding a new band makes....! A difference from 5460 pts to 28,764 pts!" EDN magazine for 2 Feb 2012 had a very interesting project with applications in the contester's shack. "Implement an Audio-Frequency Tilt-Equalizer Filter" by Francesco Balena also referenced "Designing A Pocket Equalizer For Headphone Listening" by Chu Moy. Both could be put to use on headphone audio out of a contest radio, particularly to compensate for hearing loss or frequency roll-off. Math fans will want to check out the Math Monday column by George Hart on the Make magazine website. There are 100 columns with all sorts of interesting and often visually arresting projects. Check out the ball of binder clips, for example! If you aren't getting the ARRL Propagation Bulletin by Tad K7RA, there is a lot more to it than just solar indices. Tad spices up the discussion with background on solar events, stories from readers, and great links to online resources. Log into the ARRL web site and click "Edit Your Profile" - you'll find the bulletin on the "Edit Email Subscriptions" tab. Given the amount of paper ham shacks and workbenches tend to attract, this do-it-yourself design from the Instructables web site that combines paper storage with shelf space should be attractive to many readers. Bob W9KNI wrote in with a positive review of a very useful tool - this time a cable cutter from Harbor Freight. This cutter is cheap and does an super job cutting RG-213 or the like to prepare for installing a PL-259 - clean as a whistle and no deformation of the cable. Technical Web Site of the Week - The website Amanogawa has many nice online electromagnetic engineering Java applets that open in separate windows for circuits, antennas, transmission lines, EMC/EMI, and a very interesting Smith Chart tutorial. I was poking around in my toolbox and junk box and rooting through parts bins recently when I came across a little box marked "Crystals". Oh yeah, I recalled - I had picked these up from various hamfests and whatnot when one caught my eye. My rack of crystals from my Novice days was long gone but I'd never gotten over that feeling of plugging in an FT-243 and pounding some brass, seeing the needles jump, and just maybe hearing my call come back over the headphones. Having several crystals was important if you wanted to call a station that might be several kHz away and not make them tune the whole band to find your 3-by-3-by-3 plea for attention. Of course, with the broad-as-the-side-of-a-barn receivers most of us used in those days, being a little off frequency wasn't the handicap it is today...you just had to squint! I enjoy holding a crystal now - if it happens to be on a useful frequency, so much the better, but that's not the story. The point is the feel of it and the way it was manufactured and used. Those old crystals - from JAN, Texas Crystals, International Crystal, and many, many other companies from the back pages of QST - were hand-assembled and had attractive logos and text engraved into the crystal holders. Each one was an advertisement for the manufacturer and many were miniature works of art in their own right. Some were even hand-labeled as the Bliley crystal in the photo. Everybody ought to have one little thing from 'back then' - maybe a tube or a key or a meter or an insulator. Hold it in your hand and think about how many different meanings that artifact has had throughout its history. At first, it might have been cutting-edge technology, then a more ordinary commodity, finally to be dropped into a junk box as obsolete. Someday, someone like me spies and buys it for a pittance - like a lucky radio buckeye, polished and rounded and comfortable in my pocket or drawer. If the item Is truly fortunate, its new owner may go home and put it on the air once again. I am reminded of many childhood stories of forgotten toys that were rescued from an attic or basement to find new purpose. I have a soft spot for crystals, obviously, but you might find a tool or connector equally evocative. "Old" is subjective - perhaps all we mean is just "from a period preceding mine". These visitors from era gone by help connect us to the traditions of radio. 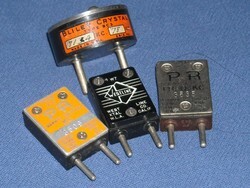 Like grandparents, they connect us to history and might be no farther away than the next hamfest or swap meet, in a little box marked "Crystals".